Ohio in Photographs is a collection of stunning images that capture the texture of life in the Buckeye State. Two of the region's's leading landscape photographers, Ian Adams and Randall Lee Schieber, present a rich array of places and people from each of Ohio's eighty-eight counties. Divided into five regional chapters, the book includes scenes from urban and rural environments, from natural areas, historical sites, public gardens, cultural and sporting events, workplaces, and more. 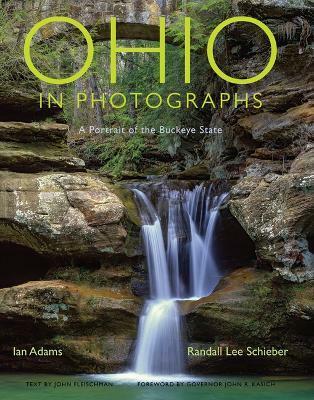 With chapter introductions by author John Fleischman, Ohio in Photographs is a can't-miss for any Ohioan at home or away. "These photographs will help you make sense of the great equation that is Ohio, where landscape, history, and eternal human hopes flourish between the great lake, the winding river, the rough plateau, and the wide horizon." -- From the introduction by John Fleischman, author of Mid-Century City: Cincinnati at the Apex "This volume of superb photography, captured by two talented artists, reflects not only the timeless natural beauty of Ohio, but also modern-day landscapes and urban scenes from the energetic, forward-looking state we are building today." -- From the foreword by Governor John R. Kasich "Flat-out gorgeous ... The uniformly excellent work of Adams and Schieber carry the book." "A fresh look at the history, energy, and geographic diversity of the place we call home." John Fleischman writes science for the American Society for Cell Biology and nonfiction books for older kids including Phineas Gage: A True But Gruesome Story about Brain Science and Black & White Airmen. Fleischman was an editor at Ohio and Yankee magazines, a John Simon Guggenheim Foundation fellow, and a part-time linotypist at the Yellow Springs (Ohio) News. Ian Adams has twenty-one photography books and more than sixty-five Ohio calendars to his credit. He conducts nature and garden photography seminars, workshops, and slide programs throughout North America and teaches digital photography at Ohio State University's Agricultural Technical Institute in Wooster. Randall Lee Schieber is a photographer based in Columbus, Ohio. He specializes in editorial, architectural, location, and travel photography and has published six books and numerous calendars. His work has appeared in a variety of local and national publications.